Were you a fan of Cloverfield? 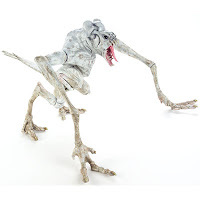 Would you like a Cloverfield Monster of your very own to menace your bookshelf or cubicle? Do you have $100 to spend? Well, then Hasbro has the product for you. The 14" Cloverfield Monster action figure features 70 points of articulation, authentic movie sounds, two interchangeable heads and 10 parasite creatures. It also comes with a Statue of Liberty head accessory to re-enact the memorable scene from the movie. Now, I collect movie memorabilia, and own my fair share of action figures. This is a pretty cool item to commemorate a film that was, in my opinion, pretty damned entertaining. However, the $100 price point is ludicrous no matter how limited the production run is. As a collector and a movie fan, this figure gets a major pass from me. Also, one of the main things that makes Cloverfield work is that the monster isn't iconic. Looking at this toy, the creature is little more than a bat without wings. In the film, however, we only see bits and pieces of it, and the handheld camera point-of-view gave the monster a necessary sense of scale. Casting this creature in plastic to put next to Darth Vader and Spider-Man in a cubicle destroys the film's mystique. Merchandising this film may be the wrong way to go. But as I said in an earlier post, bring on the sequel.